I'll spare you some more Christmas talk (I'll get back to that tomorrow). 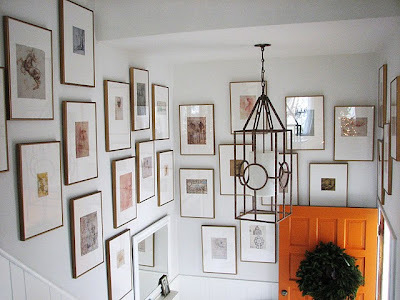 But for today, I want to show you some before and after photos of the home of designer Lauren Liess of Washington, D.C.
Let me preface this by saying that Lauren and her husband bought a home that had been sitting on the market for nearly 4 years. 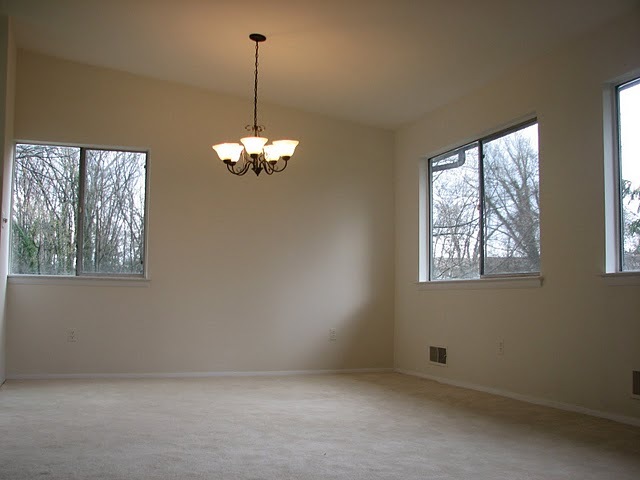 It was built in the 70's and everyone (including their realtor) told them to steer clear. But lucky for us, they didn't, and the transformation is astounding. First up is the kitchen. 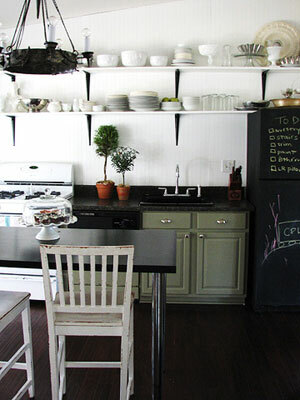 Lauren and her husband installed new walnut-finish elm flooring, added an open island from ikea, put up white beaded board, hung a flea market chandelier, painted the lower cabinets and replaced the top cabinets with open shelving. Quite the change, huh? 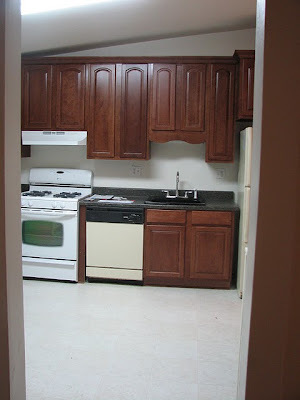 And because they didn't have to buy new cabinets, they saved a ton. I've always adored open shelving and after seeing this transformation, I might just have to put up some of my own in our next place. 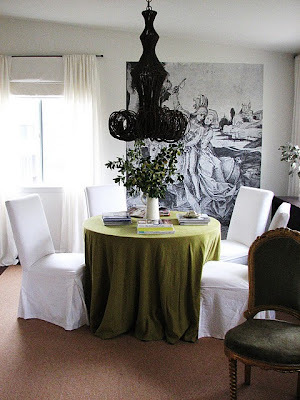 New furniture (those parson chairs look awfully similar to mine shown here), curtains, table cloth (chartreuse is one of my favorite colors), chandelier and blown up 15th Century drawing (excellent idea) make this room complete. 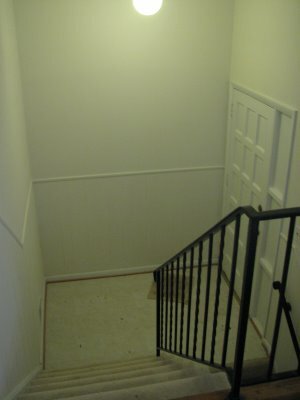 And last but not least, I wanted to show you her entry way. Here it is before...bland and dated. 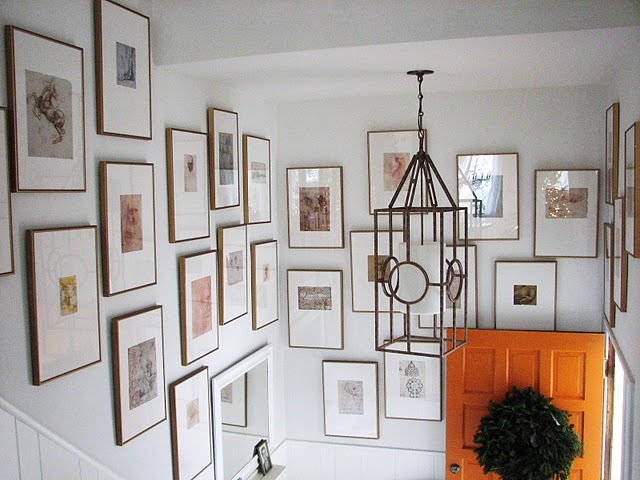 A new coat of paint, framed sketches taken from a Leonardo da Vinci book, lantern chandelier and orange door truly make this an entrance. For more photos of her home and portfolio, head over to her blog. You're very welcome! I love your style and hope to be as successful as you one day!